Years of near universal easy money policies led to an investment boom in commodities, which led to overproduction that coincided with languid demand, which led to a crash in prices, which led to a rout in commodity currencies. Then the Fed started its cacophony about raising rates; it pulled hot money into dollar assets, pushed up the dollar further, and left commodity currencies twisting in the wind. Among them, one stands out: the Canadian dollar. The rout in commodities has ravaged Canada’s oil patch and its mining sector. For example, home sales in Calgary, the epicenter of the oil patch, have plunged 25% year-to-date. Canada is in one of the most magnificent housing bubbles the world as ever seen, and when it pops in Toronto or Vancouver, there will be fireworks. But not yet. The economy shrank for the first five months of the year, after already shrinking in November last year, and is likely in a technical recession (two quarters in a row of GDP shrinkage). And the problems are spreading. Business investment spending seems to have dried up in Canada. Trade data shows real imports of both industrial machinery and electronic equipment fell in Q2 at the fastest pace since the 2008/09 recession. The bad news doesn’t end there unfortunately because a further contraction in investment is highly likely in the second half of 2015. Even low interest rates may not be enough to entice firms to increase investment outlays especially when profits are declining and the growth outlook is weakening due to persistence of depressed oil prices. The investment decline won’t be isolated to the energy sector. Thanks to the sinking Canadian dollar, it’s now more expensive for everybody to import capital goods. But some intrepid souls see a glimmer of hope for the loonie. Commodities have plunged so far that these intrepid souls think they won’t plunge much more. And the loonie being a commodities currency, well, you get the idea. One of these intrepid souls is Steve Sjuggerud. In his article, “The World’s Most Hated Major Currency Hits an 11-Year Low,” he offers a two-part conclusion: Part A makes total sense to me, and if I had the time, I’d do it instantly, regardless of what I think might happen to commodities and the loonie…. Crashing oil prices, crashing commodity prices, and a super-strong U.S. dollar – these three have been the trifecta of pain for the Canadian dollar in recent years. All three of these together have pushed the Canadian dollar to an 11-year low. In today’s essay, I’ll show you why the Canadian dollar could bottom out soon and start a solid rally. Right now, “real money” traders have a massive bet against the Canadian dollar. We can see by looking at the Commitment of Traders (COT) report – which tracks the “real money” bets of futures traders. Today, the COT shows traders are uniformly betting against the Canadian dollar. This is a great contrarian sign. It shows that everyone who wants to sell the Canadian dollar has already sold. There’s nobody left to sell. “Real money” traders have only had a significantly larger bet than today’s one time in the past – in early 2007. The Canadian dollar absolutely soared right after that – from $0.85 to $1.08 in about eight months. That’s a 27% move, a huge move in a currency! Today, sentiment on the Canadian dollar is at the worst level in history (according to Jason Goepfert of SentimenTrader.com, whose data go back a few decades). That also tells me the bottom should be near. So what’s going on? And when could the rally in the Canadian dollar start? The Canadian dollar is known as a “commodity currency.” Its currency tends to rise and fall with commodity prices. The problem is, everywhere you look, commodities are crashing. The Bloomberg Commodity Index, which currently tracks futures prices for 20 commodities, is down 62% since peaking in July 2008. 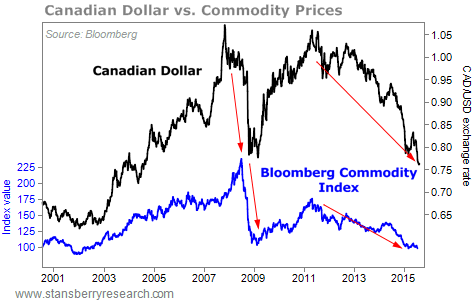 You can see that the Canadian dollar crashed the last two times commodity prices peaked and began a bear market. It fell 22% from July 2008 to March 2009. And since peaking in mid-2011, the Canadian dollar is down 27%, a huge decline for any major currency. Canada’s currency can bottom out here, simply because there’s nobody left to sell. However, the legitimate bottom will happen when commodity prices finally bottom. The best way to take advantage of it now is to get yourself up to beautiful Vancouver, my favorite city in the world. I was just there for more than a week, and I can confirm that – except for real estate – prices in U.S. dollar terms were cheap! Double bottom in the Commodity loonies chart, breaks out down, or rebound. A lot of stuff is in this position either double top or bottom over a long time frame . The double dip from the 08 crash has not really occurred, due mostly to QE and the false market and false recovery that has existed since then. There is also a potential in that chatrt to establish an 075 105 range which fits with this very false sideways market if it dosent breakout down. So I trade the indexes and currency’s, from charts, combined with fundy’s and new’s, which is what I do.With very close trailing stops and limited liquidity in the Accounts I trade with (Which do not have negative balance liability’s on them). The other thing that could change everything is a big war, West Philippine Sea and iran being the potential roots for one, or two melding into a big one.. The problem is not that commodities will go down more before bouncing back. The problem is there’s a very distinct possibility commodities may plateau at levels near present ones for years. While this is hardly good news for all commodity-driven economies, it’s especially bad news for advanced ones, chiefly Canada and Australia. Not only debt loads are very high, but neither country can afford a long spell of relatively cheap commodities without deep and unpopular restructuring. Apart from a brief spell between 2008 and 2009, commodity producers had over a decade of fat cows. Now we know the 2009-2010 recovery was a one time colossal dead cat bounce driven by China’s frantic attempts to obtain growth through empty apartments and bridges to nowhere which actually made things even worse by ensuring more capacity would come in line. but back at the time it seemed confirmation commodities could only go up. This led Australia and Canada to continue on the previous path of unsustainable growth in spending in all sectors, which led to massive leveraging all over the place and assorted bubbles inflating in both countries (see the almost twin Vancouver and Sydney housing bubbles). Granted, central banks will rush in with more interest rate cuts and perhaps some form of BOJ-style ETF purchases but as Europe showed at very most ZIRP can delay liquidation, not buy growth, and NIRP just flat out don’t work. Both Australia and Canada face another problem: it really seems like the fat lady is clearing her throat in China. The Shanghai Composite and the Shenzhen Small Caps are just the tip of the iceberg: China’s real problem is massive overcapacity in all those sectors that until last year swallowed Canadian timber and Australian iron ore like there was no tomorrow. At the moment it seems like the Communist Party is losing control of the situation: after years of turning a blind eye on China’s egregiously doctored macros, banks, analysts and fund managers are all calling China’s bluff. The numbers (electricity consumption, car sales, housing starts etc) literally do not add up. I am sure the zealous bureauracts in charge of China’s statistics will “adjust” those numbers soon enough but imaginary cars and apartments do not require iron ore, oil, coal and timber. Just some imagination. In the past years Sumitomo Mining sunk a true fortune (over half a billion US dollars) in a massive met coal mine in Australia, solely to supply the Chinese market. Two weeks ago they sold that colossal, state of the art mine for the princely sum of one Australian dollar. I very much doubt Sumitomo would have cut and run if the present situation in China were just a hiccup: Sumisho (the conglomerate’s sogo shosha) has been on the ground in China since the 80’s and is effectively Sumitomo’s intelligence agency. If they feel the wind is turning, I would take heed. Sumitomo got more than $1.00 as the mine was sold inclusive of its liability’s which run into hundreds of millions if not billions. Also Japan is turning its nukes back on, one thing about sumitomo compared to some other keiretsu they are not scared to say that was an ohpps, correct, and move on. Australia dosent have the leverage that Canada does, also with the weakening of the $AU Australian gold is still very profitable and Aussie owned. Oil is not imported. Australia has the leverage issues it has, as the evil Socialist female creature “juliar gillard” did what she was told not to, and spent the mining revenue in advance. AU unemployment has stabilized currently, The ANZAC Nations never get as doom and gloomed as everybody else as we can always hunt and fish for lunch, always easily year round catching something big and good. Its called the lucky lands for a reason. Unlike Canada that goes under Ice for half the year. By the way Julian- it just came back to me – yes the Walter Hoving incident is from Art of the Deal. I read it 30 years ago. As I recall now it concerned an early deal for air space rights above the Tiffany property, and prices of air space rights had begun to take off so Trump wanted to nail down the price. However Trump’s contempt for any non-binding ( i.e. not legally enforceable) agreement is a cliche in the New York real estate world. He employs an army of lawyers who do nothing but look for profitable loop holes in good faith agreements. This is why he finds Hoving, an old world gentleman, beyond remarkable. To Trump, Hoving is an alien. Oil products are imported which are more costly than oil. TAPIS is still over US$50.00 a barrel which means we are paying roughly 20% more than other parts of the world. Oil products are imported for expediency. Oil products are also exported. There are several important differences between Aus and Canada. There is the proximity to market- I was surprised to learn that even at these prices Iron Ore Co of Canada is still shipping millions of tons to US via great Lakes. Second: Canada has a far larger manufacturing base: did you know that Canada’s car plants have at times outproduced the US- sure they are branches of GM and Ford, Chrysler but the jobs are here. Magna a huge parts company just bought Getrag the German transmission corp.
Quebec Hydro is a BIG supplier of power to the US. Aus is close to Chinap -that’s been great- now not so much. Canada is close to US- cleanest dirty shirt. I live in logging country on the BC coast. I have been waiting for the shutdown to occur, especially with China’s building boom exposed for what bit is. But no, the 77 cent dollar still keeps everyone I know working. When reality hits and the shut begins, it will probably go on for years. Just like the artifical boom has done. I have said on the forum many many times, not all Canadians are in debt up to their eyeballs for over-priced homes. Not all Canadians live in Toronto and Vancouver. Furthermore, most Canadians could care less what happens to the ‘market’ in those cities. In fact, when the crash does occur, (and it will), I think many will feel a just reality has struck. Furthermore, overpriced housing has bled into other areas when folks sell out to foreigners, buy new where regualr folks live, and then put $500,000 in the bank for extra retirement cash. It will be nice to see that come to an end. I have also repeatedly asked on this forum, if the ‘correction’ gets really really bad in response to the artificial props rotting away before our eyes, where would you prefer to live? I think I would pick Canada, first….maybe New Zealand 2nd, and Austrailia 3rd. US, (and 1/2 my family are American so I am definitely not slamming anyone here), Us is not on the list. Maybe money people will lose their investment shirts, but that is not Canada or the strength of her people, any more than Donald Trump represents America. Think about it, would the rest of America care if Google, Tesla, and Facebook crashed and burned into bankruptcy? I can hear the yawns and “serves them right”, now. That is how we feel about Toronto and Vancouver ‘s housing bubbles. If you want work go to AU there is more, if you want lifestyle and have money go to NZ especially if you are a boatie or fisho, its a wealthy or rich mans paradise especially outside the main centers. As a Canadian living in the US, I can tell you the US is a very very big country. There are good places to live and there are bad places to live for various reasons, just like in Canada. I would love to see people in Toronto, Vancouver and Alberta (and a bunch of other overpriced US cities) get burned badly when the bubble pops. The rest of Canada will do just fine as you mentioned. We’ve been through a lot of recessions, this one will be no different and with Canada’s social net we don’t feel it the way people in the states feel it. I compare Vancouver and Toronto to two big stones thrown into water. The ripple effect of overpriced properties spreads far and wide. The property taxes collected also support and hide a non-economy that developed. Branding the Canadian dollar a “commodity” currency and describing its fall from $1.08 USD to under $0.80 ignores the reality that the U.S. national debt has increased almost exponentially since 1997, while the Canadian debt actually declined 1997 to 2009 from about $600 billion to $500 billion ,subsequently rising. It makes no sense to me- have a look at these charts. (nonetheless, catching a falling knife can be dangerous to one’s health). It’s all about perception (and reality). The US is a bigger and more diversified economy, while Canada seems to be more of a one pony trick. The US Dollar is also a reserve currency, creating a floor for demand. I sold my house in August 2014 (370K) and when I deposited the proceeds the Royal Bank asked me if I wanted a US dollar account. I passed and yes it has cost me. But there is a consolation- Baby, I’m in Canada- where US based Starbucks is welcome to do business but doesn’t have to ask customers to leave their assault rifles at home. The USA definitely is over-extended, and the Trump phenomenon amuses me greatly. I read both of Trump’s books long before his presidential aspirations, and while anyone can guild the lily, Trump strikes me as a decent man, and he sometimes admits shortcomings. One involved the air rights when he built the Trump Tower. He and Walter Hoving of Tiffany’s had a handshake agreement on the price but Hoving had to go abroad and told Trump they’d do the paperwork when he got back. In the meantime the opponents of the project got wind of the deal and were trying to outbid him, as he couldn’t build sans the air rights, Trump got nervous and called Hoving, who told him “Young man, I shook your hand. We have a deal on price, and it won’t change.” Trump had been swimming with sharks so long he’d forgotten that this was the way business was done. While I don’t think Mr. Trump can stop the coming train wreck, I can think of no one better suited to manage the aftermath. There is much talk of fleeing America to other destinations, and kudos to all of you who speak up for your respective countries. Even if I had the wherewithal to flee I would plant my standard here. I am not afraid of Trump becoming Lenin to Obama’s Kerensky. O’Donnell was Trump’s right hand man. I suggest anyone thinking of supporting Trump (who by the way will drop out as soon as serious money is required, as he did with his last fake run) read the whole book. Here are a few OTHER facts from O’Donnell. Trump hung around with horse folks who hung around the casinos. One high roller and a genuine horse lover went in with Trump on a very promising colt- sealed on a plane with a hand shake- no paper. A few weeks later the big man drops in at the barn to see the horse ‘breezed’ – run fast. The trainer says the horse has a cold- how about next week.? No Mr. Trump wants to see the horse put out. A day later the trainer, in tears, phones O’Donnell- the horse has fluid in the lungs and has lost circulation in his legs. The other owner places a call to Trump to discuss treatment- through a secretary he gets his answer: Mr. Trump no longer wants to buy the horse. Trump had three top executives die in a helicopter crash. After a very short time, according to O’Donnell, Trump begins using them as posthumous negotiators. All three have been involved in deals that were in the verbal stage; so when the other party says: ‘He (the deceased) said it would cost X’ -Trump insists that his aide told “The Donald’ something else. The other party is reluctant to question the word of the deceased. Conclusion: Although Trump has no intention of actually running, i.e. making a big media buy, hiring a staff including a campaign manager ( A job for which there will not be a stampede by the qualified) and blowing a hundred million- he is muddying the water enough that O’Donnell’s book should be re-published in paperback or maybe best- published as a e-book. Mr. O’Donnell- do your country a favor. What no one has bothered to mention is the divergent monetary policies of Canada and the US. That has a great impact on the bond yield spread which in turn devalues the Canadian dollar due to selling. The US will most likely raise rates next month and Canada may actually cut again, as our economy is in serious trouble. That will increase the USD/CAD ratio regardless of commodity movement. I don’t know how you can say all CAD has been sold off. Maybe the bulk of FOREX traders are locked in already, but there will be more sell offs as the FED rate move upward after a decade of ZIRP. If the oil glut continues it may result in more GDP contractions and Job losses and if the US economy does well along side our misery the Canadian dollar can go bellow .70 USD. Close to reaching bottom? I think not. Hi Julian_ I too read Art of the Deal and was a Trump fan for a while. (BTW- it is also known as Art of the Spiel) The book is a genre known as hagiography meaning praise disguised as documentary. It is usually written with a writer who is paid a fee whether the book sells or not. Its main fib- it presents Trump as Horatio Alger, self- made, when he inherited about 200 million. He was and maybe still is a highly respected manager of casinos but is probably retired by now. blame you at all for being skeptical- we need more skeptics. Just read the book, but it is hard to find. There is one thing that is verifiable, however-Trump has never run for president. You mention not getting past RINO’s- Ross Perot ran as an Independent! It hasn’t cost Trump anything yet to pretend he’s running. He is a firm believer that there is ‘no such thing as bad publicity’ although getting kicked off some stages for his anti -Hispanic rants may be an exception. When I saw “most hated currency” I thought it was going to be about gold. Canada has national elections in October 2015. If the NDP or Liberals (both left wing) win separately or in coalition, many fear that the these leftist parties will crush the oil sands business in Alberta either through regulation or taxation. If so, the Loonie is nowhere near a bottom vs. the dollar. The only difference between Tory policy and Liberal Policy is the speed by which they ram it through. Liberals are just a watered down “diet version” of the Conservative Party. Go back to 2006 and look at the whole income trust debacle. The NDP would more likely be considered centre-right in Europe. Thought, I throw it in for it’s entertainment value.